U.S. Sen. Al Franken on Wednesday formally requested that both Apple and Google create privacy policies for all applications available for their respective iOS and Android mobile platforms. Franken, D-Minn., called on the two companies "to require clear and understandable privacy policies for all of their apps." 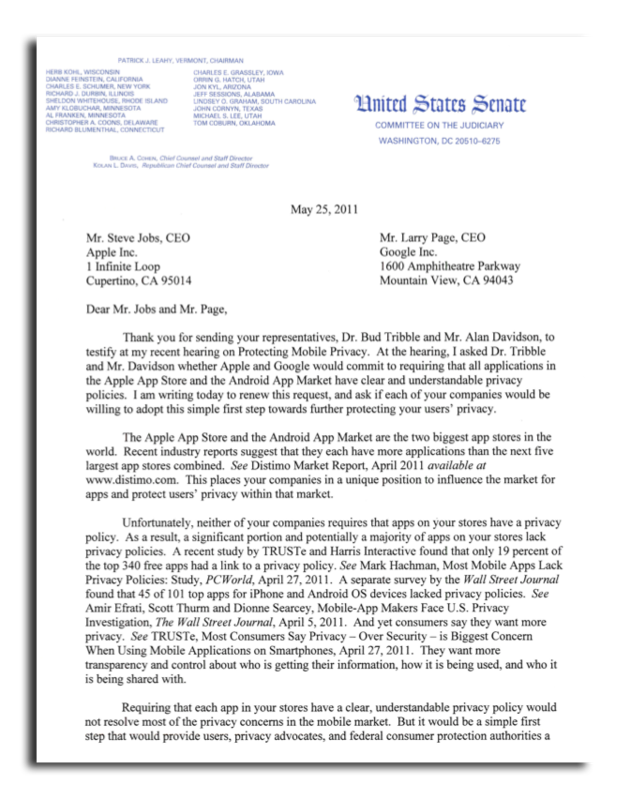 The letter, addressed to Apple Chief Executive Steve Jobs and Google CEO Larry Page, is a follow-up to discussion that took place earlier this month during a Senate hearing in Washington D.C.
"Apple and Google have each said time and again that they are committed to protecting users privacy," the senator wrote in a letter to the companies. "This is an easy opportunity for your companies to put that commitment into action." Franken acknowledged that the implementation of formal policies would not resolve most privacy concerns in the mobile market. But he also argued that it would be a "simple first step" toward protecting personal data. "Although I believe there is a greater need for transparency and disclosure for the collection and sharing of all personal information, at a minimum, I ask that you require all location-aware applications in your app stores to provide privacy policies that clearly specify what kind of information is being gathered from users, how that information is used, and how it is shared with third parties," Franken's letter to the companies reads. "These apps constitute only a subset of all of the apps available on your stores." Privacy concerns related to mobile devices gained international attention when a pair of security researchers discovered that Apple's iOS 4 mobile operating system recorded location data and saved it in a hidden file unbeknownst to users. That data was never transmitted to anyone, and the issue was quickly addressed with the release of iOS 4.3.3.